You think you know a place until you see it with different illumination or higher resolution and then new features or understandings pop out. 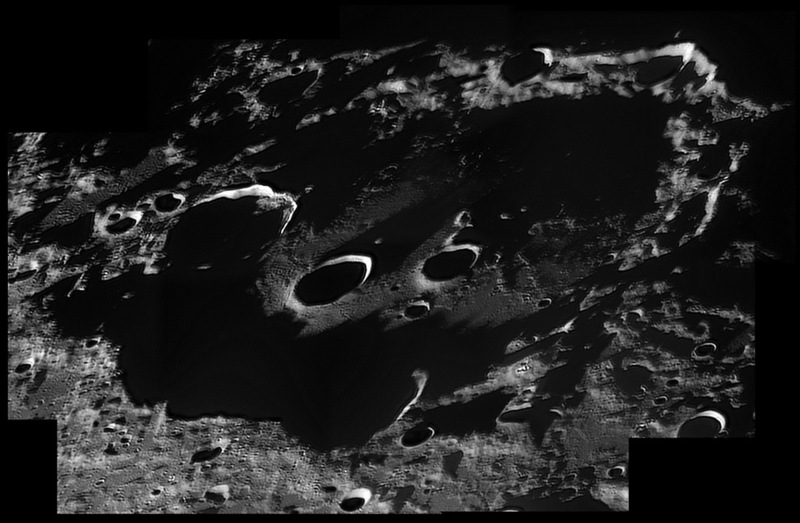 If the Sun were any lower in this mosaic by Damian all of the interior of Clavius would be just inky blackness. Here the rims of Rutherfurd and Porter just catch the light, as do those of C and D (the bigger one) on the floor of Clavius. One feature I was unaware of is the smooth ramp, almost like a dome, against the northern interior of Clavius D. This feature doesn't show on higher sun views, but once known can be glimpsed on good images with intermediate illuminations. I suppose it is just a wide area of the uplifted rim but it looks more extensive than that. C14 with SKYnyx 2.0M. May 26th, 2007, Barbados, W.I. Tomorrow's LPOD: Too Much Resolution? This page was last modified on 25 September 2018, at 01:04.